I often eat my lunch in a bookshop café, and while I was doing so today, I happened to sit at a table next to the photography section. This is a passion of mine, so my eyes wandered over the books as I ate. A book entitled “Soviet Bus Stops” immediately caught my eye, with its minimalist design and stark concrete structure on the cover. I picked it up and had a look, but it was shrink-wrapped so I couldn’t see what was in it. 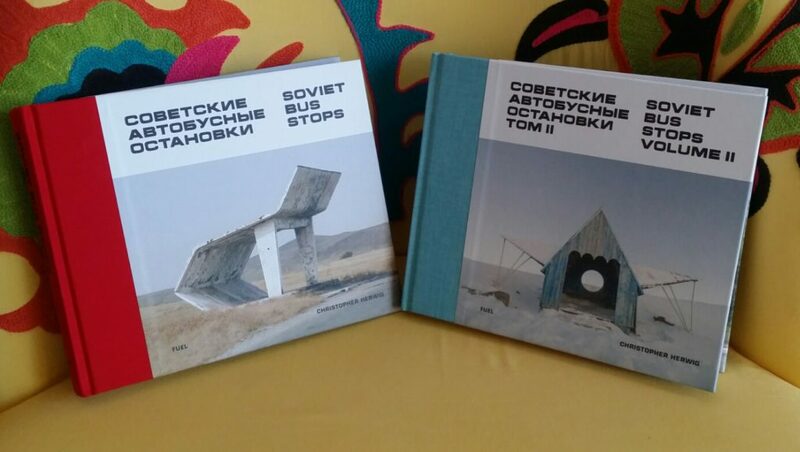 However, I had a feeling I’d love it, so I bought it – and “Soviet Bus Stops Volume 2” – on impulse. I unwrapped and read the first book on my journey home from work, and I’m pleased to say I made the right decision – it’s a little gem. Like many photography books, you can leaf through it in little more than a few minutes, but you’ll go back and enjoy it again and again. The author spent no less than twelve years photographing bus stops across the whole of the former Soviet Union, and the structures he found are incredibly varied and eccentric. More often than not, they’re in remote and bleak surroundings and in a state of disrepair, but somehow that just adds to the charm. Interestingly enough there’s not a single photo of a bus in the whole first volume, apart from a couple of images of toy buses at the front and back, but there’s a few in volume 2. A few human interest pictures feature, but generally the photos show quirky and varied structures in a fairly empty landscape. There’s actually some real beauty in some of these pictures, and it’s immediately made me think that my own urban landscape is incredibly bland and dreary. Murals and mosaics abound, and make you realise that the former USSR wasn’t just about brutal uniformity – there was some variety and creativity in there as well. As I caught my own bus home from work today, I was struck by the rather miserable shelter and the general grottiness of it all. I think we need rather a lot more public art, and a better standard of detail, design and creativity in our public services and facilities. Of course, one organisation that has always done well on that front is Transport for London, formerly known as London Transport, that right back into the early years of the twentieth century put a great emphasis on good design – public art was incorporated into a lot of Underground stations, and many of them, especially the ones built in the 1930s, are works of art themselves. Perhaps I should start a campaign for better bus stops.